T-Mobile and Sprint vow that customers will be better off if they are allowed to merge. Some experts aren't buying it. In a video announcing their plans to get together, T-Mobile (TMUS) CEO John Legere and Sprint (S) CEO Marcelo Claure promised lower prices, increased competition and, one day, faster internet through 5G. A successful merger would reduce the number of major wireless service providers in the United States from four to three — the combined company plus Verizon (VZ) and AT&T (T). Deals like this have not helped reduce prices in the past, warned Bill Menezes, the principal research analyst covering mobile services for Gartner Research. "I can't think of another market where consolidation has been beneficial to consumers in that respect," Menezes told CNNMoney. In theory, he said, the new company, which would be led by Legere and keep the name T-Mobile, could keep prices low. But fewer competitors and new priorities make that unlikely. T-Mobile made a name for itself by aggressively cutting prices to compete with Verizon and AT&T. In 2013, the company started offering bargain plans with no contracts. The "uncarrier" model transformed the marketplace, giving customers more choice and better deals. The overall cost of wireless service has come down 19% in the last five years, according to government statistics. And T-Mobile has gained market share — mostly at the expense of Sprint, not its two larger rivals. Michael Copps, a former FCC commissioner and special adviser to the watchdog group Common Cause, said T-Mobile's strategy was a direct result of its need to compete with Verizon, Sprint and AT&T. But if competition is reduced, Copps said, T-Mobile will be less likely to think creatively about customer needs. "I don't see the benefits for consumers in a marketplace where Verizon and AT&T and new T-Mobile would be calling all the shots," said Copps, who was appointed to the FCC by President George W. Bush and also served during the Obama administration. Claure argued that wireless providers are no longer just competing against each other, but also against cable providers such as Charter and Comcast, which have started offering cell phone plans. "This industry is no longer just four wireless companies," he said in the video. "Wireless, video and broadband — they're all converging. ... It's not the Big Four anymore, it's the Big Seven or Eight." But Menezes said it's premature to think of cable providers as competitors in the cell phone market. "That's still a 'what if,'" he said. 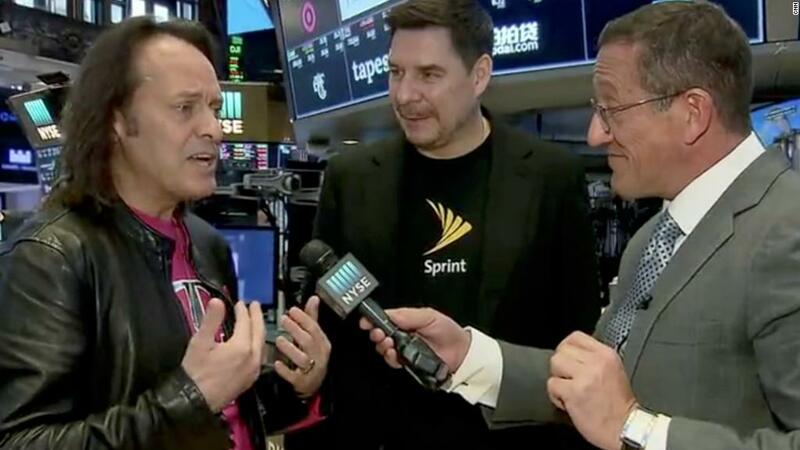 Legere and Claure have also touted the deal as critical to their ability to bring 5G, the next generation of wireless network technology, to more Americans. "Only the new T-Mobile will have the network and spectrum capacity to quickly create a broad and deep 5G network," Legere said. In the long run, access to 5G through a new T-Mobile may indeed benefit consumers. But "they've got to make it happen in order for it to be a benefit," Menezes said. In order to deliver 5G to customers, T-Mobile and Sprint will have to play catchup, said Hugh Tallents, partner at the management consulting group cg42. Compared with their competitors, "T-Mobile and Sprint are way behind," he noted, adding that it will be very expensive to "fight the 5G fight." Those and other expenses, like Sprint's hefty debt, could ultimately harm consumers and increase prices, Copps said. When mergers of this size go through, he said, companies put "consumer interest down even lower."